So envious of these big cats! Dada the hero! Got his girls each their own popcorn. Emma practicing her doctoring skills on her Dada. Emma and Abby enjoying their inflatable bouncer with all the colorful balls. We hosted Christmas dinner at our home and Nana and Poppa came over to eat and watch the girls open all their wonderful gifts. We had a really wonderful time with our family and watching our girls enjoy themselves as they played with their new gifts. 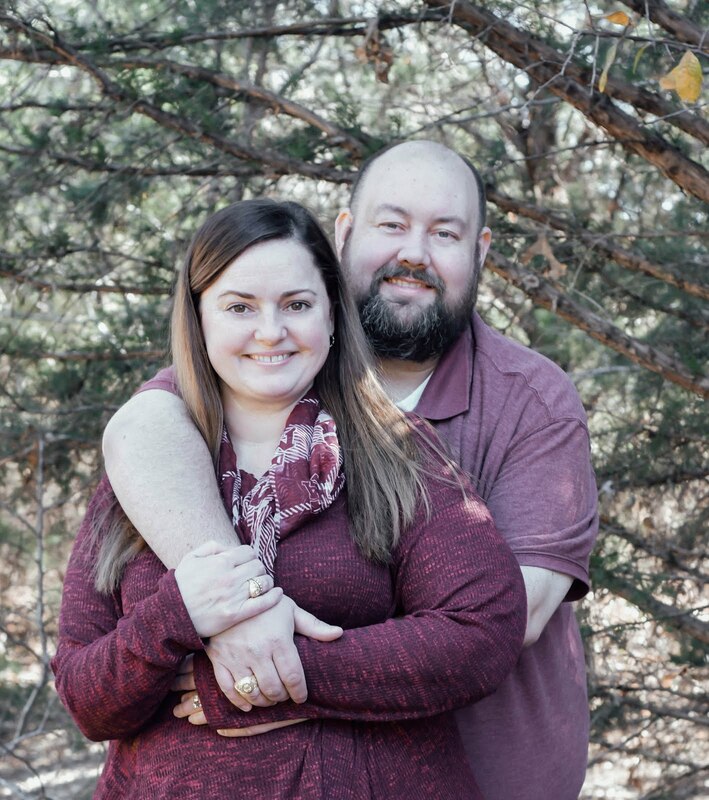 We feel extremely blessed to have all the time we have had with all of our family this Christmas. These memories made will be forever proof of the blessings for our girls look back on for years to come. Poppa always cooks Christmas breakfast and Nana always makes homemade hot chocolate. We took the girls over as soon as they woke up and began our Christmas with breakfast and gifts from Santa. Above are the videos of the girls at their Nana and Poppa's house Christmas Eve night. They both got to open a gift there before heading home to settle in for the night. Emma and Abigail opening their traditional gift at our house before getting ready for bed. They both receive PJ's on Christmas Eve to sleep in as they wait for Santa to show up. Emma holding her dog Reggie with Brandie and Abigail. Tank, the youngest of all the cousins, was all smiles. Abby thought it would be a great idea to sit on the gifts to try and open them. For Christmas Eve day we went to the Housley side of the family and gathered with all of the girls cousins so they could play and open gifts together. The girls received many beautiful outfits from their Memaw and Keith along with a princess doll each. We had a wonderful time and ate some great food. 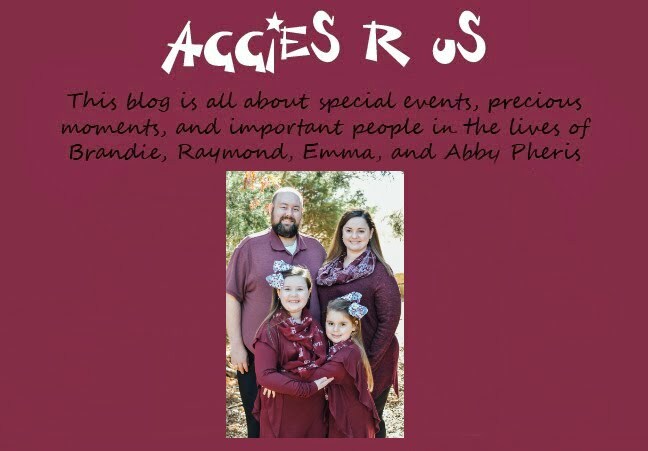 The girls always look forward to going and seeing the Memaw and cousins, knowing that they get to see their dog Reggie is a plus! Emma sitting with some of her cousins. For the Pheris side of the family we gathered on Saturday, December 22 at cousin Kelly's house in Houston. We had a wonderful time with family and ate some really delicious food. We watched our precious girls play with their cousins and open all the gifts from their Great Aunts and cousins. Both girls had a blast and were fast asleep on the ride home. 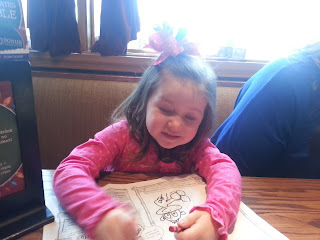 Emma coloring at the restaurant at the Chesser family gathering. 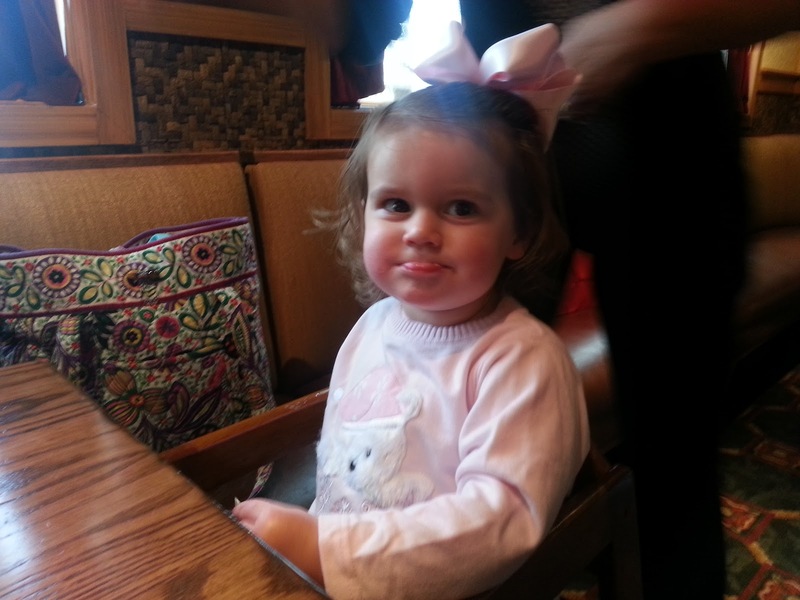 Abigail sitting at our table waiting for her chips and salsa. For the Chesser side of the family, Aunt Trish organized our gathering at a wonderful restaurant called Jimmy Chonga's in Pasadena. There was a total of 28 of us and all went well. The service was great, the food was tasty, and the girls had more than enough entertainment with all that family around. We hope to gather more often and be able to spend more time with all of them so our girls can get to know them better. Abigail was given the huge green stocking on the left and Emma was given the custom made Santa bag on the right both filled with goodies and candy. 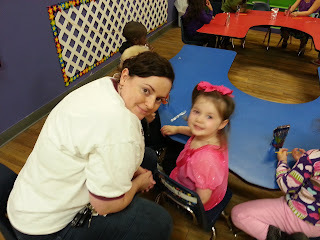 Emma with her Mama at her party. 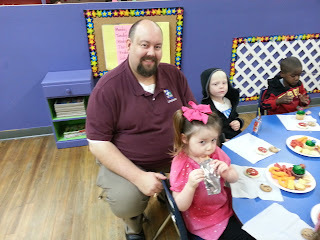 Emma with her Dada at her party. 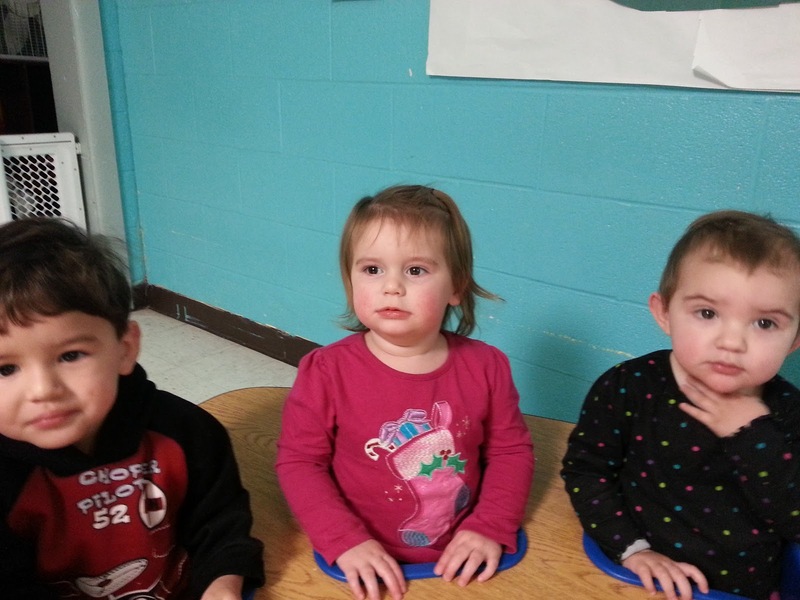 Abigail sitting with her friends at her party. The girls had a wonderful time at their school Christmas parties. We both took turns sitting with each of the girls and it took us two trips to get them and all of their goodies into the van before leaving. We are thankful that our girls have teachers who care and go out of their way to create special treats for them. 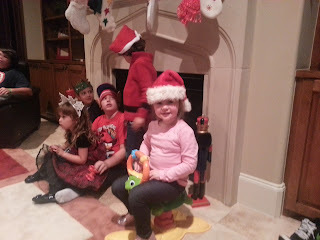 This is a video of Abby participating in singing Jingle Bells with her class from day care. This is a video of Emma singing Rudolph the Red Nosed Reindeer with her class from day care. As you can see, the girls had an exciting evening and got to perform in their first Christmas program. Nana and Poppa were able to attend as well, and the girls performed wonderfully! Emma has been enjoying the Disney princess more lately so above is the Princess gift wrap we selected for Emma's gifts this year. I created four different types of bows for her gifts this year. I am very proud to say that all bow products were not purchased but recycled from last year and even the year before. I am trying to branch out and try new ideas and create the ideas myself. For all bows that you see I created them on my own and yes I used the hot glue gun! Abigail has really taken an interest in Minne Mouse and Mickey so we decided to go with this paper for her this year. She enjoys the show and carries around a Minne Mouse toy whenever she can. With these boys I used two different types of ribbon one of them being a wired ribbon. The Maroon and Gold wired ribbon is recycled from being our outside ribbon from 2005 when we first started decorating the outside of our house for Christmas. So there are some special memories tied to these bows. I made three different types of bows for Abby's gifts. These are the gift bags for our little girls Christmas parties this week. We found them about two weeks ago and purchased them in excitement and went and bought the goodies to go in them yesterday. We created a custom princess coloring page that says Merry Christmas from Emma and Abby and it will be placed inside the bag with the candy for all the kids to enjoy. Oh the joys of being a parent and getting to do all this fun stuff again. This was my first attempt at making cream cheese cinnamon roll monkey bread. It turned out really well, but I will be trying a different recipe for Christmas Eve and Christmas morning. It is a new tradition that we will be starting in our family. Having Monkey Bread with Hot Chocolate while opening gifts! Nothing better to give the girls the energy bust to play with their toys the rest of the day ha! Gifts for my side of the family. We will be getting together with them on Christmas Eve and my girls are getting really excited about Christmas and getting to see their Memaw. We will be taking the traditional homemade chocolate fudge and banana bread. My Aunt Robin looks forward to the banana bread every year, Ray makes both of the items, I just show up and look cute! Ray's gifts for Christmas. He gets five gifts just like the girls and that one gift he has already received due to the fact he had to go purchase it himself. In our move into our own place last month the t.v. in our room went out and needed replaced so when all the crazy deals were occurring that was when he purchased his first Christmas gift, the rest were selected by his girls and myself. Throughout the wrapping process I am proud to say I only burned my finger twice with the hot glue gun. Some would ask why I use a hot glue gun... it is easier to keep the bows on with two little girls with hot glue. It is also easier to keep the bows on the gifts when transporting them from one location to another. It is Christmas time, and as you all know that is a big thing around the Pheris house. The girls have started on their Advent calendars. They have three of them: two are activity based and one is reward based. The top picture shows the reward one. Each day they get to open the present box and get a treat inside! The other two are the Christmas tree and Mickey Mouse ones. We got there in the Christmas store inside the Magic Kingdom this summer. Emma does the Christmas tree, on which she gets to select a cloth ornament to hang on the tree for each day. Abby's is velcro based, and she gets to pick one and attach it to the wreath. We usually do this in the morning after they have found their elf Tinkerbell, and it has become a fun morning ritual! My wonderful place were I work is spreading Christmas cheer by celebrating Christmas with us by having "Milstead's 12 Days of Jeans". I have never before worked at a location or heard of other work environments that have done this before, I love it. Not only do we get to wear jeans, but for each of the 12 days they bring in other little things for us to do to celebrate and enjoy each others company during this special time of year. December 14th- Ugly Sweater Contest: Dig through your closet and dust off your oldest, ugliest sweater. Stop by Mrs. Medina’s office to have your photo taken for the judging. December 18th- Wrap up for the winter and wear your scarf, hat, gloves, etc. The girls checking out their treat box. Abby checking out the lights on the tree. Emma adding her homemade ornament to the tree. Emma and Abby adding ornaments to the tree. Abby adding an ornament to the tree. Our girls were so excited to see us putting up or tree! Emma was jumping up and down yelling Christmas! Christmas! Abby wanted to touch everything and get into everything. They really enjoyed putting on the ornaments. Abby enjoyed taking them off and having Emma put them back on. We took two days to get it all done due to the girls enjoying it so much, we wanted to extend their fun. We spread out our Christmas decoration into every part of our home so that we can enjoy the Christmas spirit no matter what room we are in.